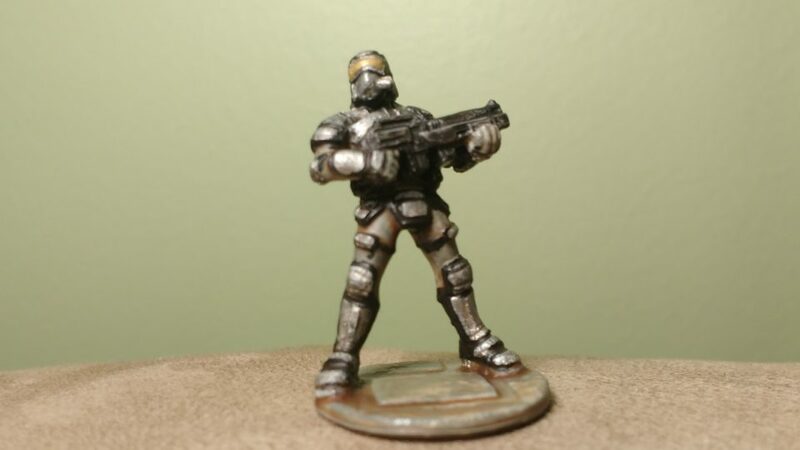 Another miniature from the original Reaper Bones Kickstarter, I started off painting just one so that it could serve as a guide for uniformly painting the remaining Nova Corp miniatures. I plan to use the set, once complete, as generic SciFi soldiers for whatever scenario comes up. I like that the Nova Corp miniatures are neutral – they don’t shout “I’m a bad guy” or “I’m a good guy”, just “I’m heavily armed.” I tried to give this one a similar paint job that would allow them to fill a variety of roles within a campaign. In what’s become standard procedure, I used the DIP method to seal the miniature and followed up with a second matte seal to double up on protection while removing the shine.